She ran off thrilled. It wasn’t long before she was back again. “Do you mind if I sell some of my toys I don’t use anymore? Now that I am almost 10 years old, I have a lot of stuff I no longer need.” And with this, she became a Facebook Swip-Swap Entrepreneur. In about a week’s time, she had earned $145. While perusing swip-swap watching for buyers, she came across a queen size bed for $125. She had been begging for a “big girl” bed, wanting to move out of her twin bed we purchased when she moved out of her crib. “May I buy this bed?,” she asked. After consideration, she decided she would like the bed more. She proudly handed over the $125. And immediately began posting her existing furniture and more toys for sale. In just a few more days, she had sold another $350 worth of items. She bought a desk for $40. She found a chair and storage bench on Amazon for $100. She bought paint for her room, another $100. 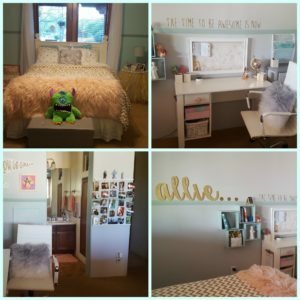 And this is Allie transformed her room from baby girl to tween glam just in time for her 10th birthday! All with money she earned! So what can we learn from Allie about accomplishing our own dream? 1) She asked for what she wanted. She created a list, thought about it and then asked for it. What is it that you have been dreaming about? Ask for it! 2) She negotiated! She didn’t accept the first offer to pay for it herself, she negotiated and gained agreement to acquire the hoverboard for a lower cost. Never accept the first offer. Negotiate everything. If you don’t ask, the answer is no. 3) Allie didn’t let her big dream intimidate her. Even though her weekly earnings seemed low in comparison to the cost of the hoverboard, she didn’t let that stand in the way of her dream. She simply kept inquiring and searching for ways to acquire the hoverboard. And with each way she found that didn’t meet her goal, she went back and searched for another way that might. Stay focused on the big dream and keep brainstorming ways that work. 4) She got advice from people who had sold on swip swap before. She isn’t old enough to sell on swip swap, but she knew it was a way to make money and she knew she had things to sell. So she wisely sought the advice of someone who had done it before. Someone who could help her be successful as she entered territory she had never traveled before. Get a coach! This will allow you to get better and faster results. 5) She took action! This is where most dreams die.. Nothing works unless you do! Take the first step. 6) She didn’t let anyone bring her down. Some kids laughed when she told them what she was doing, some thought it was cool, some thought she couldn’t do it. She didn’t listen to any of them. She just did it. Find your whoo-hoo crowd and don’t listen to the boo-hooers. 7) She was open to possibilities. Once she was well on her way to earning money, she allowed herself to be open to the idea that even though the hoverboard was what had started her down this path, maybe there was something she would enjoy even more with her money. Reserve the right to get smarter each day! Learn More! Continue the conversation with a free 30 minute coaching session with Phoenix Motivational speaker Jean Briese Free 30 Min Coaching Session or Subscribe Now for more tips on living abundantly.